"The closer she (the Good Samaritan) got, she saw the cat was spray-painted purple and saw an injury on its neck. It was a very open wound." It is a debatable point as to whether it is adults or juveniles who commit the worst offenses against cats and kittens. The same likewise can be said for the immense joy that both groups derive from their lawlessness. Juvenile cat abusers, on the other hand, spare the public from having to listen to any exculpatory nonsense and instead simply glory to the hilt in their abject cruelty and wickedness. A rather poignant example of how that they think and behave occurred on April 9th when a group of them either trapped or somehow cornered a two-year-old gray cat subsequently dubbed Churchill in Essick Park on Church Street in Reading, one-hundred-five kilometers northwest of Philadelphia. Once they had him at their mercy, these pint-sized devils methodically proceeded to spray-paint him purple and to burn a three to four-inch gash in the left side of his neck. It is not known precisely how that the latter injury was inflicted, but it could have been done with either a cigarette lighter or a propane torch. There really is not any way of knowing either what other forms of cruel and inhumane punishment that they had in store for Churchill or even if he ever would have made it out of that wretched park alive if an unidentified Good Samaritan had not arrived upon the scene in the nick of time. What transpired next is far from clear, but these cowardly monsters apparently vamoosed at the very sight of the woman. 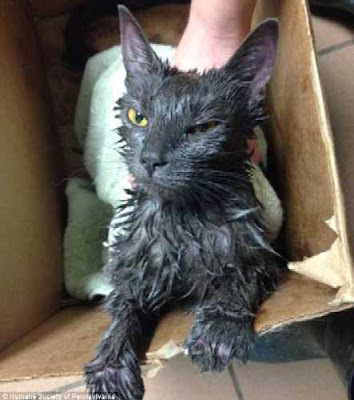 "The closer she got, she saw the cat was spray-painted purple and saw an injury on its neck," Nan Parks of the Animal Rescue League of Berks County (ARLBC) later told WFMZ-TV of Allentown on April 19th. (See "Cat Spray-Painted, Set on Fire in Reading.") "It was a very open wound." She immediately scooped up Churchill and transported him to the ARLBC's shelter at 58 Kennel Road in Birdsboro, thirteen kilometers southeast of Reading, where she then abandoned him at the facility's stray animal building. She was thoughtful enough, however, to leave a note with him detailing the location and circumstances under which she had found him. Since press reports have not divulged exactly when Churchill was assaulted, it is not possible to pinpoint when that the Good Samaritan arrived with him at the ARLBC's shelter. Nevertheless, given that is only open from 11 a.m. until 4 p.m. on a Sunday coupled with the fact that she was forced to leave a note, the assumption, correctly or incorrectly, is that Churchill was left unattended. It likewise never has been explained why that she chose the ARLBC over the Humane Society of Berks County (HSBC) which, at 1801 North Street in Reading, was only 2.73 kilometers, or about an eight minute drive, north of Church Street as opposed to the sixteen minutes that it took her to cover the 8.69 kilometers that separate Church Street from Kennel Road. The latter also is open from 9 a.m. until 5 p.m. on a Sunday but Humane Veterinary Hospitals Reading (HVHR), located next door, is only open Monday through Saturday. It thus would appear that cats who are either injured or become sick on a Sunday are out of luck in Reading. It accordingly is entirely possible that Churchill was forced to go without treatment until the following day and during such a long interval he easily could have died from an infection or lost his eyesight. Even as things eventually turned out, the pain and torment that he was forced to live with were bad enough. Once staffers at the ARLBC belatedly got around to treating him, they discovered that in addition to the ugly gash in his neck, he also was suffering from a foggy eye and an untreated ulcer. No details of the type of care that he received have been divulged but staffers apparently were able to shampoo the paint out of his fur because he does not appear to have been shaven in photographs of him that later were released to the press. His eyes likely were flushed with water and treated with medicated drops whereas the wound to his neck had to be cleansed, medicated, and bandaged. Afterwards he in all probability was administered antibiotics, painkillers, and fitted with an Elizabethan collar. Hopefully, the veterinarians were able to have saved his eyesight and his neck should heal in time. Even so, his recuperation is expected to take several months and that admission thinly suggests that his injuries may have been even more severe than the ARLBC has been willing to publicly acknowledge. 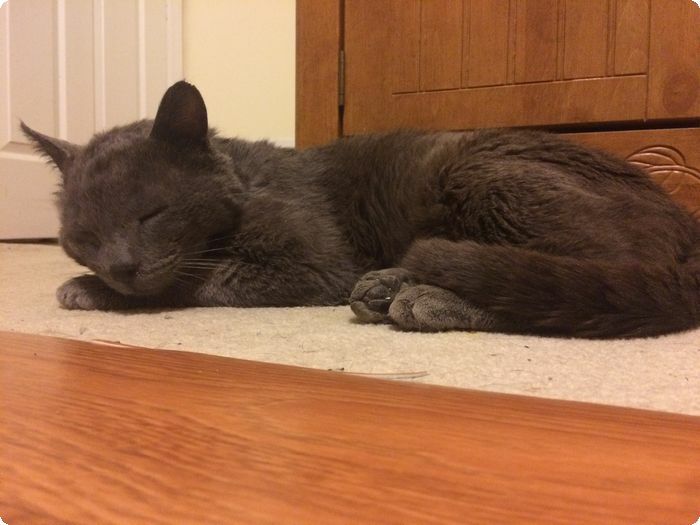 He was placed in foster care on April 14th with one of the charity's volunteers and is said to be adjusting as well as possible to his new surroundings. 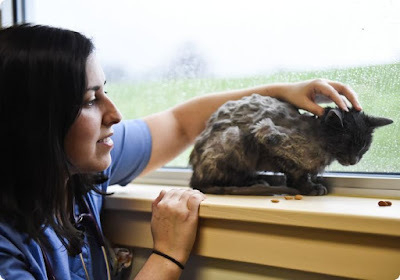 "He's definitely been through the ringer for his young age, but he's a sweetheart; a super-great cat," ARLBC's shelter manager Sarah McKillip testified to the Reading Eagle on April 20th. (See "Cat Spray-Painted, Suffers Burns in Reading.") "For everything he's been through, he has every right to hate mankind. But he doesn't." Even individuals who work with them on a daily basis, such as McKillip, always seen to be surprised by cats' total lack of malice and that in itself tends to suggest that they fail to fully appreciate them. First of all, cats are not people; in fact, they are far superior to them. Secondly, there simply is not any way that any of them ever could get even with a monster as vile as man so holding grudges would be a waste of time and cats are smart enough to realize that. Given Churchill's friendly nature, he likely at some point previously had a guardian in Reading but, for whatever reason, that individual has not attempted to reclaim him. While it is always conceivable that an unwillingness to pony up for his veterinary care could very well be at the heart of that utterly shameful abdication of moral responsibility, it also is possible that one or more of his attackers were family members. Press reports have not broached the subject of whether he was wearing a collar or had been microchipped but the inference is that neither were the case. It likewise has not been disclosed if he had been sterilized. His right ear does not appear to have been mutilated and that, in most instances, forecloses the notion that he could have belonged to a managed TNR colony. Consequently, not only is his past a mystery but also how that he wound up in Essick Park. The ARLBC claims to have interviewed several potential witnesses in the area surrounding the park but that, as far as it is known, constitutes the sum total of the effort that it has invested in attempting to bring those responsible for attacking Churchill to justice. Accordingly, no arrest has been made and none is expected. Instead, the public has been treated to the customary outpouring of crocodile tears and expressions of moral outrage. "We'll do everything we can to stop (abuse), but somebody has to speak up," McKillip pontificated to the Reading Eagle. "Every time when you think you've seen it all, you're wrong." Whereas there is not any doubting the veracity of her last statement, she is living in a dream world if she truly expects the public to do the ARLBC's and the Reading Police Department's jobs for them. Besides it being outrageous of her to fob off responsibility for enforcing the anti-cruelty statutes onto ordinary citizens, they are not about to take up that gauntlet in a million years. Besides, they do not possess either the expertise, resources, or the authority to investigate crimes of this nature and thus to make arrests. Only humane groups and the police are equipped to do that but neither of them have much interest in doing so. Her colleague, Parks, was equally long on the rhetoric but disturbingly short on action. "This is something that is wrong," she declared to WFMZ-TV. "It's inhumane and we really want justice for Churchill." Furthermore, it is not only cats are being preyed upon in Reading but dogs as well. For instance, a Chihuahua dubbed Lady Luck was plucked from a garbage can in the 1000 block of Penn Street on April 19th. Like Maisy, she since then has been placed in a new home. Clearly, there is a lot that is rotten in Reading but given the intransigence of both the law enforcement community and humane groups, those individuals and organizations that truly care about cats need to seriously consider new approaches to this age-old dilemma. One option would be to hire private dicks in order to investigate cases of animal cruelty. A second alternative would be for rescue groups to recruit and train volunteers to do this long-neglected job. Just the mere presence alone of an army of dedicated volunteers prowling the streets for cat abusers might be sufficient in itself in order to deter some would-be abusers. Merely accepting cruelty to cats as an unalterable fact of life should not be an option but that is precisely the position that the ARLBC has adopted in regard to what was done to Churchill. "You're never happy to see abuse, you're never happy to see these things go on, and it breaks your heart to see it," McKillip philosophized to the Reading Eagle. "But at least he's with us, and I knew he'd be okay." That is not necessarily the case in that one day he is going to leave foster care and then he will be subject to same dangers as before. Consequently, temporarily safeguarding the life of a solitary cat is tantamount to using chewing gum to stop up a gaping hole in a ship the size of the Titanic. The objective should be to ensure the safety and well-being of all cats at all times and in order to do so it is paramount that abusers and killers be apprehended and severely punished. Anyone or group that is unwilling to commit the time, effort, and resources that are required in order to transform that worthy goal into a reality might just as well shut up and thus spare the world from having to listen to their phony-baloney excuses. If that were the whole story it would be bad enough in its own right, but many humane organizations exploit acts of cruelty as a means of raising cash for other activities. Whereas it is readily acknowledged that all of these cash-strapped organizations desperately need money for, inter alia, veterinary care, adoption services, and general operating expenses, there nonetheless is something inherently dishonest about accepting money under false pretenses. Even if humane groups somehow could be prevailed upon to take cruelty to cats seriously, that would constitute merely the first baby step on a long and difficult road toward holding their attackers accountable under the law. That is because district attorneys do not have any interest whatsoever in prosecuting animal cruelty cases, juries refuse to convict, and even when they do judges will not punish the guilty. Given that is the case with adult offenders, it is even more so the norm with juveniles who are permitted by societies all over the world to injure and kill cats with impunity. In furtherance of sating their perverse desires, they have appropriated for their use practically every known means of killing cats imaginable. On those rare occasions when they get bored with sticking it to cats, they train their bottomless fountain of evil upon other animals and, especially, homeless men. Since societies do not have any more regard for those two groups than they do for cats, juveniles are likewise allowed to assault them with impunity. Those individuals responsible for that litany of crimes as well as those who so hideously abused Churchill should be treated as adults under the law and dealt with accordingly. That is not about to happen, however; instead, they are allowed to remain free and to grow into adults where they commit even more dastardly crimes against both cats and society at large. Even damaged as he is, Churchill is awfully lucky to still be alive but if something is not done soon in order to make Reading a far safer city for cats, he may not be able to stay that way for much longer. The same holds true for countless other felines who sans doute are being abused, maimed, and killed but whose plights never have seen so much as the light of day. Photos: Animal Rescue League of Berks County (Churchill's burned neck) and the Reading Eagle (Churchill asleep on a mat). "I was awake all night Tuesday (April 4th) hoping that she would just get through the night. This has been one of the worst cases I've dealt with. I was in tears most of the night worrying that she would pass away." A cat-hating monster of undetermined pedigree and affiliation wanted one-year-old Maisy dead so badly that either he or she went to quadruple lengths in order to turn that objective into a reality. That individual began by binding the small, brown-colored cat's four appendages with, most likely, either rope or some type of tape before dousing her from head to toe in petrol. The next order of business was to seal her up tightly inside a plastic trash bag an then to stuff her into a garbage can at the curb in order to be collected by the trash haulers. Any one of those diabolical means would have sufficient in that, first of all, the fumes from the petrol would have, sooner or later, either sucked the breath out of her or damaged her respiratory system so irreparably that she no longer would have been able to breathe. She additionally could have been burned alive in the ensuing conflagration if a passerby had unknowingly tossed a cigarette into the garbage can. Secondly, she very easily could have suffocated to death inside the bag. Thirdly, she likely would have been unwittingly crushed to death by either the trash haulers or at whatever facility that they dump their loads at the end of the day. Finally, if against all odds she had been able to have weathered all of those perils, she surely would have succumbed to hunger and thirst at some point. 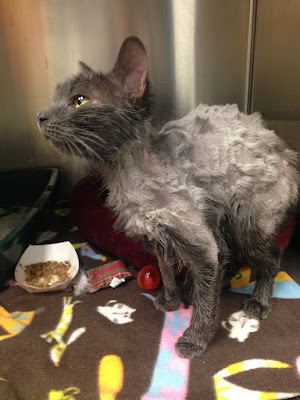 It accordingly is hard to imagine that any cat ever has found herself in such dire and utterly hopeless circumstances. Her very clever assailant thought that either he or she had covered all the bases but that individual made one little mistake in that he had failed to gag Maisy. As things eventually turned out, that oversight made the difference between life and death. At some undisclosed time during the afternoon of April 4th, two garbagemen stopped to make a pickup in the 500 block of North Front Street in Reading, one-hundred-five kilometers northwest of Philadelphia, whereupon they nonchalantly picked up the bag containing Maisy and tossed it in the rear of their truck. The bag in short order was packed and crushed. Normally, that would have been the end of Maisy and this story never would have been written but she, somehow, had miraculously eluded being crushed to smithereens by the compactor. Every bit as amazing she still had enough life still left in her tiny body in order to cry out for help. 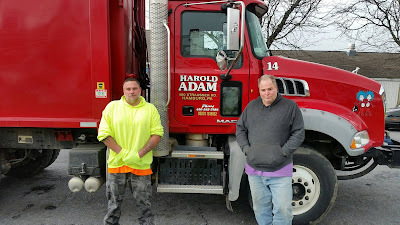 The unidentified workmen, who slave away for Harold Adam Refuse Removal in Hamburg, three-three kilometers north of Reading, not only heard her plaintive cries for help but waded into the piles of smelly and rotting garbage in order to pull her out alive. They did not stop there, however, but instead took time out from their exceedingly demanding schedule in order to transport her to the Humane Society of Berks County (HSBC). She almost immediately was transferred next door to Humane Veterinary Hospitals Reading (HVHR) where Kimya Davani and her crackerjack staff launched into an all-out race against the clock in order to reclaim Maisy's fragile life from the ice-cold hands of the Grim Reaper. Considering the pitiful state that she was in, the odds were heavily stacked against Davani and her assistants. Since she had been so extraordinarily lucky in avoiding the compactor's blade, the staff christened her Miracle Maisy. Even so, the estimated six hours that she had spent breathing in the petrol fumes had taken their toll on her. "The first twenty-four hours are crucial. Though there are no visible life-threatening injuries, we are worried that the toxicity of the gasoline has affected her lungs and neurological functioning," Davani disclosed to the Reading Eagle. "At this time, we're monitoring her for onset illness and ensuring that her chemical burns and bruises heal properly." In addition to all of that, her body temperature had dropped precipitately, she was emaciated, dehydrated, and had sustained unspecified damage to her liver. The most pressing issue, however, was to remove the petrol from her fur and skin before it siphoned the life out of her. In furtherance of that worthy objective, Davani and her staff spent the greater part of that first day shampooing and drying Maisy's fur but when that endeavor ultimately proved to be insufficient they were forced into taking a bolder initiative. 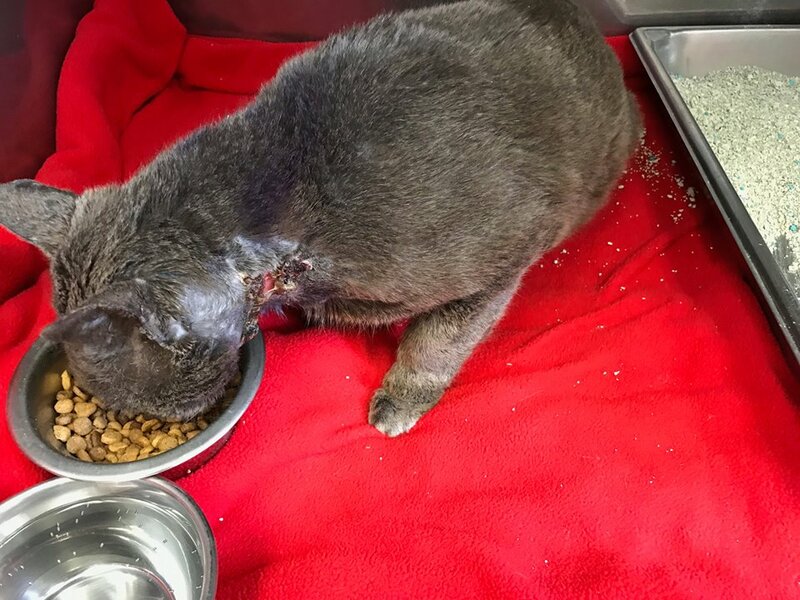 "The gas was so embedded in her fur that she wasn't drying, and because of this her internal body temperature had dropped," Davani told the Reading Eagle. "We had to shave most of her body in order to get her temperature up again." She also was outfitted with a sweater in order to help her keep warm. After that, however, there was little that Davani and her staff could do except to wait and hope for the best. "I was awake all night Tuesday (April 4th) hoping that she would just get through the night," she told the Reading Eagle on April 7th. 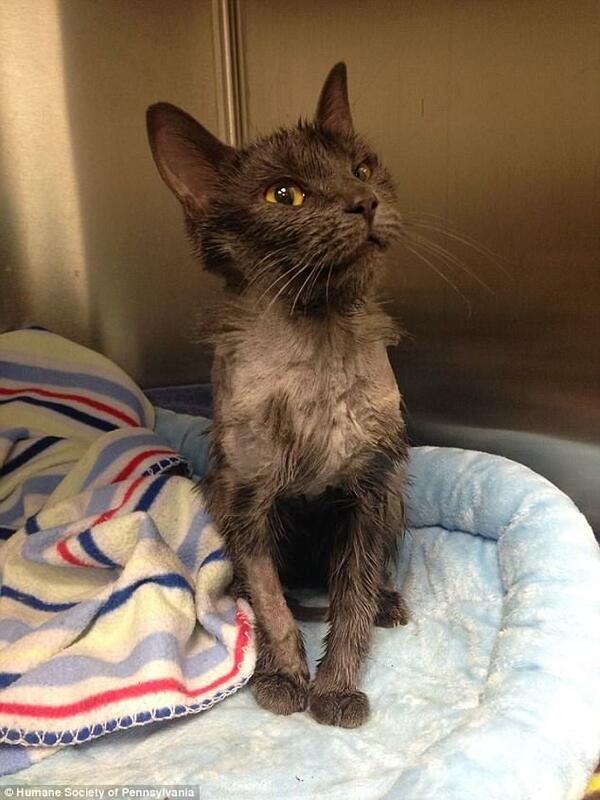 (See "Miracle Maisy on the Mend.") "This has been one of the worst cases I've dealt with. I was in tears most of the night worrying that she would pass away." Anyone who ever has attended to ailing cats can readily sympathize with those sentiments. The overwhelming majority of the time they do not pull through whereas in other instances they mount courageous, last-minute rallies only to turn around and break their owners hearts to bits by succumbing to the Grim Reaper's machinations. 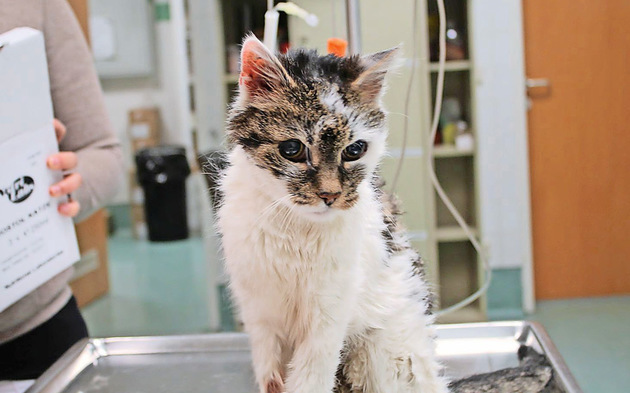 One never knows how these things are going to turn out unless one is willing to pull out all the stops and to travel that last, lonely mile in an effort to save a dying cat's life. It does not happen too often in this world but ever once in a blue moon even the calloused hearts of The Fates can be swayed by tears and that, mercifully, was the case with those that Davani shed on Maisy's behalf. "Maisy is feeling great today. Most of her vitals have returned to normal and she started bonding with some of our staff members," Davani was able to joyfully report to the Reading Eagle on April 7th. "But I think she may still be a little overstimulated with all the attention she's getting." By either April 8th or April 9th, she was well enough in order to be placed in foster care with a woman identified only as Donna. A few days later she was dewormed and vaccinated against rabies and the Feline Panleukopenia Virus. "Her coat is slowly growing back in, and her skin redness has subsided substantially, though she's feeling a bit itchy now. She is still underweight but has shown improvement since her last visit," Davani's colleague at HVHR, Alicia Simoneau, wrote in an untitled April 12th article that was posted on HSBC's Facebook page. "One concern that remains is her constant paw and tail flickering. This could be the lingering effects from the gasoline exposure, and we'll continue to monitor her for changes." On April 14th, she was spayed and returned to her foster mom. In an April 18th posting on HSBC's Facebook page Donna described her as "playful, affectionate, and super-friendly." Following a detailed screening process, the HSBC said good-bye to Maisy on either April 29th or April 30th when it and Donna relinquished custody of her to an anonymous adopter. "Maisy is settling in nicely. She's radiant energy!" that truly blessed individual wrote May 1st on HSBC's Facebook page. "Within twenty-four-hours she already started purring, investigating, and playing. String seems to be her favorite toy." The HSBC was equally ecstatic. "We're over the moon knowing Miracle Maisy has a home, one that will erase all the bad memories of her traumatic experience and replace them with nothing but love and kindness," it wrote in the same Facebook article. The response from the authorities to this latest, horrific act of cruelty perpetrated against an innocent and defenseless cat has been predictable; c'est-à-dire, all blow and no go. "It's critically important that we protect the animals in the community," Karel Minor of Humane Pennsylvania, an umbrella organization of which HSBC is a member, told the Reading Eagle in the April 6th article cited supra. "It's our goal for whoever committed this terrible crime to receive the help they need or the prosecution they deserve." Given that PETA's wholesale crimes against the species have been so thoroughly documented, the capitalist media's stubborn insistence upon doing its bidding can only mean that they not only share its viewpoint but support its killing of cats. Absolutely no one has the guts to call a spade a spade but allowing PETA to put in its two cents' worth on any issue affecting cats is tantamount to the media designating the Ku Klux Klan as the go to organization for a comment on issues concerning black-Americans. Make no mistake about it: PETA does not speak for any individual or group with any degree of credibility within the feline protection movement. Au contraire, it mouths off only for itself and its champions within the thoroughly dishonest and discredited capitalist media. Animal cruelty cases are solvable only through the application of sound detective work and although the Reading Police Department (RPD) is supposedly looking into the attack on Maisy, there is not so much as a scintilla of evidence that it has stirred so much as a muscle in that regard. Even in those rare cases when arrests have been made, prosecutors rarely go after the culprits with anything other than wet noodles, juries fail to convict, and even when they do judges adamantly refuse to mete out any jail time. On the positive side of the ledger, if this incident has exposed what The Shadow used to refer to as "the evil that lurks in the hearts of men," it simultaneously has highlighted the good that is also to be found therein. First and foremost, there were the two-hundred individuals who by April 6th had compassionately opened up their hearts and wallets to the tune of US$6,500 for Maisy's immediate care. "We have been very surprised by the support we've received," Mary Keller of Humane Pennsylvania told the Reading Eagle in the April 7th article cited supra. Secondly, Maisy was the beneficiary of the expert and conscientious care provided by Davani and her staff at HVHR. At the very pinnacle of this honor roll of heroes, however, are the trash haulers from Harold Adam without whose derring-do Maisy never would have made it to HVHR in the first place. "We are so thankful to those men and the trash company for bringing her in," Cappellano acknowledged to the Reading Eagle on April 6th. "Many people would have turned a blind eye in this situation, but they were proactive in getting her the help she needs." Truer words never have been spoken and this pair of hard-working men are true heroes in every sense of that word. They even stopped by HVHR on April 7th in order to check on how Maisy was progressing. The compassion that they showed Maisy is not anything unusual for members of their profession. For instance on August 28, 2015, Bekir Mercil and his two assistants devoted thirty minutes of their valuable time in order to unload four to five tons of trash from their truck in order to save the life of tiny brown kitten named Melker. That is another reason why that members of the law enforcement community, such as the RPD, so stubbornly refuse to take seriously cruelty to cats. That in turn puts them in the same class of rotters as the hypocritical, cat-killing scumbags at PETA. She still has some tenderness in her hips, however, and her liver has been damaged as the result of the petrol leaching into it through the pores in her skin. Despite all of that, Davani expects the organ to improve in time and for her to be able to enjoy a perfectly normal life. Hopefully, that will come to pass but only time will tell. Not many cats that are tossed out in the trash survive long enough in order to live another day so it is high time that one of them finally got the best of those formidable odds. Hers is only one small victory, however, on a worldwide battlefield that is littered with the dead bodies of countless cats. Nevertheless, all of those involved in saving Maisy can take immense satisfaction in knowing that, at least on this all-too-rare occasion, they have prevailed over the machinations of a determined cat killer. Maisy's triumph and recovery therefore belongs to them every bit as much as it does to her and it is, above all, truly something to be celebrated and cherished. Photos: Humane Society of Berks County (Maisy covered in petrol, shaven and shampooed, wearing a sweater, playing with a string and her toys, up-close, and her saviors) and Susan Keen of the Reading Eagle ( Maisy with Davani). "Auch ihr fehlendes Augenlicht scheint sie nicht zu beeinträchtigen. Sie erkundet bereits neugierig ihre Umgebung und ist sehr geschickt, was den Schluss zulässt, dass sie bereits seit Lägerem erblindet ist." Just as the thorn always accompanies the rose, so too is it with cats in that the immense joy that they bring to their owners and supporters is always tinged with, at least, an equal proportion of profound sorrow. Das heißt, they are such tragic actors and actresses upon the world's stage that the only thing missing from their illustrious history is a dramatist of the caliber of Sophocles to do for them what he did for mankind all those millenniums ago. The outrageous Unglück that always has dogged their every step like a malevolent shadow manifests itself in a million different abuses and deprivations that fail to recognize any international boundaries and few, if any, legal and moral constraints. Consequently, to single out any one particular class of offenses from this turbulent sea of unrelenting misery is an almost impossible task but without question the utterly deplorable plight of elderly and infirm cats has to rank at the top of that list. Even so the overwhelming majority of these abused, neglected, and forgotten senior citizens of the feline world never make the headlines; im Gegenteil, they most often are either systematically liquidated by society or die in obscurity on their own. Despite that harsh reality, ever so often one of them, thanks to a favoring nod from The Fates, does come to the attention of the public and that has been the case with Orakel. Found wandering the forlorn streets of Breitenfurt bei Wien, thirty-three kilometers southwest of Wien, sometime over the long Easter weekend, she was then was transported to Wiener Tierschutzverein (WTV) in the Vösendorf section of Wien. Judging by the pitiful condition that the diminutive brown, black, and white female was in, her deliverance did not come a day too soon. Most readily noticeable to the naked eye, her fur had become so matted that she was unable to untangle it. The charity's Tierärztin soon thereafter quickly discovered that she also was suffering from severe malnutrition, respiratory difficulties, a liver condition, and that plaque had accumulated on her teeth and gums. 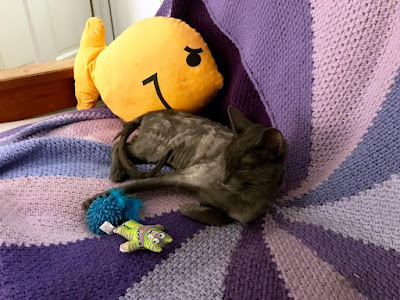 As if all of that would not have been enough misery for any cat to have borne, Orakel was laboring under two even more formidable disabilities. First of all, she was judged by the veterinarians to be at least seventeen years old and, secondly, she also was blind. No one connected with WTV has publicly speculated as to how long that she had been on her own but, given her handicaps, it would seem unlikely that she was on the street for more than a few weeks. That estimate is based upon how exceedingly difficult it would have been for her to have procured very much in the way of food, water, and shelter over a protracted period of time. Being elderly and blind, it is pretty much a foregone conclusion that she had spent her entire life indoors and therefore neither possessed the Sachkenntnis nor the means in order to fend for herself in the wild. WTV has not broached the subject, but it is entirely possible that she even may have been declawed and as such that would have made defending herself and climbing trees in order to elude predators pretty much impossible. Despite quite obviously having had at least one and possibly even more guardians during her lifetime, Orakel was neither wearing a collar nor microchipped. Furthermore, no one has filed either a missing cat report with the authorities or inquired about her at WTV. It accordingly is difficult to get around the distressing, and simultaneously infuriating, conclusion that she was intentionally abandoned. As best it could be determined, neither WTV nor the Polizei have opened an investigation into this matter but if such an effort accomplished nothing else it, if successful, would at least put a face on such a heartless crime. Abandonments occur all the time but it is difficult to fathom how that anyone could care for a cat for that length of time only to then turn around and cast it out in its old age and infirmities to fend for itself in a hostile world. Although individuals of that ilk would appear auf den ersten Blick to belong to the pages of horror stories, they in fact are definitely real. The difficulty lies in identifying them and subsequently holding them accountable under the anti-cruelty statutes. At WTV, Orakel finally received the emergency care that she had so desperately needed and deserved for so long. 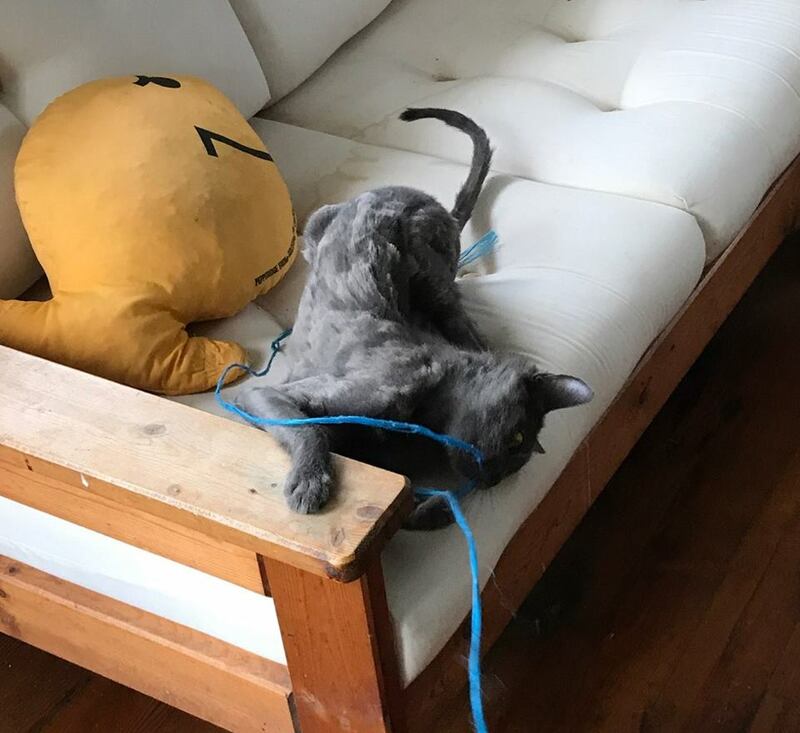 The first order of business involved brushing out as many as possible of the tangles in her fur; the remainder had to be cut out. After that she was given fluids, most likely intravenously, in order to help her regain not only strength but some of the weight that she had lost while on the street. The tartar was removed from her teeth and she was administered a battery of unspecified nonsteroidal, anti-inflammatory drugs. It has not been specified either what ails her liver or what is being done in order to treat it. Leider, her blindness likely is irreversible considering her age. Following treatment, she was transferred to WTV's Katzenhaus where she, as far as it has been disclosed, has made a remarkable comeback. "Sie scheint auch zu merken, dass sie nun in guten Händen ist, denn Orakel ist extrem anhänglich und verschmust und sucht ständig den Kontakt zu Menschen, um sich laut schnurrend von allen Seiten streicheln zu lassen," the charity added. Besides being a friendly and gregarious cat, she also is able to get around adroitly and that suggests that she, in all likelihood, has been sightless for a long time and perhaps even since birth. "Auch ihr fehlendes Augenlicht scheint sie nicht zu beeinträchtigen," WTV disclosed. "Sie erkundet bereits neugierig ihre Umgebung und ist sehr geschickt, was den Schluss zulässt, dass sie bereits seit Lägerem erblindet ist." In spite of all the wonderful progress that she has made over the course of the past few weeks, Orakel is far from being out of the woods just yet. That is due principally to the fact that she still needs a home and it is extremely difficult even under the best of circumstances for shelters to place elderly felines. For its part, WTV has pledged to attempt to provide Orakel with a "schönen und stressfreien Lebensabend" in a new home. There is not any guarantee, however, that it will be successful in that endeavor. That in turn brings up the disturbing topic of what will become of her if she is not adopted and none of the alternatives available to her are the least bit pleasant to contemplate. Furthermore, just because her former owner gave up on her, as WTV is likely to do at some point in the future, is not a valid reason for the remainder of humanity to follow suit. 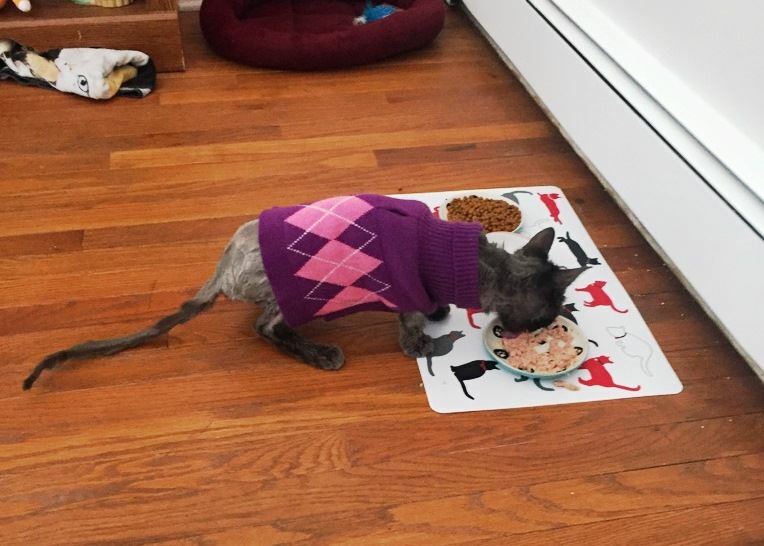 Orakel is a courageous grand dame of the feline world who has suffered much, overcome even more, and demonstrated too strong of a will to live in order to be thwarted now. She in all probability does not have all that much time left in this world but she nevertheless is richly entitled to every last second of it. Anyone who therefore is able to offer her a loving home is encouraged to contact WTV via telephone at 43-01-699 24 50 -16.